The Sweet Sixteen kicked off and carried on with the surprising occurences of the first weekend: Loyola-Chicago continues to stun everyone with close, dramatic wins, joined by Michigan, Florida State and Kansas State making it to the Elite Eight. #7 Texas A&M 72 #3 Michigan 99: So you thought the Aggies were the real deal after blowing out North Carolina? Turns out, they weren’t prepared for the Wolverines long range barrage. Michigan hit 14-of-24 three pointers and ended the game in the first half, heading to the locker rooms with a 24-point lead. Muhammad-Ali Abdur-Rahkman with 24 points (4 threes) and Moritz Wagner (21 points, 3 threes) led Michigan to its third Elite Eight this decade. #9 Florida State 75 #4 Gonzaga 60: The Seminoles held Gonzaga to just 25% from beyond the arc and 33.9% from the field to pave their way into the program’s first Elite Eight since 1993 and third overall. Terance Mann took on most of the offensive burden, scoring 18 points, while helping stifle Zach Norvell Jr., the hero of the previous games, shooting just 4-for-16 in this one. #11 Loyola-Chicago 69 #7 Nevada 68: Another low scoring game that doesn’t reach the 70’s, another close win for the Ramblers. This time it was Marques Towns with a huge three that sealed the deal, capping off his team-high 18 points performance. Loyola turned the ball over 16 times and got to the line only 8 times, but once again, their playmaking down the stretch advances them, this time to the Elite Eight for only the second time in school history. The last time? In 1963, when they won it all. 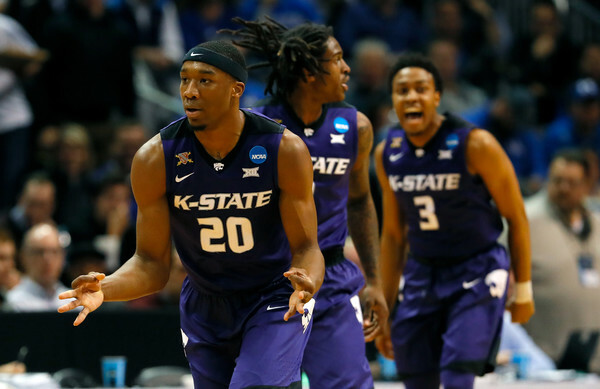 #9 Kansas State Wildcats 61 #5 Kentucky 58: The battle of the wildcats ended in a surprising twist, with KSU’s terrific defensive effort propelling them into the Elite Eight for the first time since 2010. Xavier Sneed was unstoppable, scoring 22 points off 5 three pointers and grabbing 9 rebounds, helping hold Kentucky to just 38.1% from the field. Calipari’s players got plenty of help from the refs, including 20 trips to the line for P.J. Washington, who converted just 8 of those shots.